I haven’t done a thrifty finds post in a while. Thought I would show you a few finds. 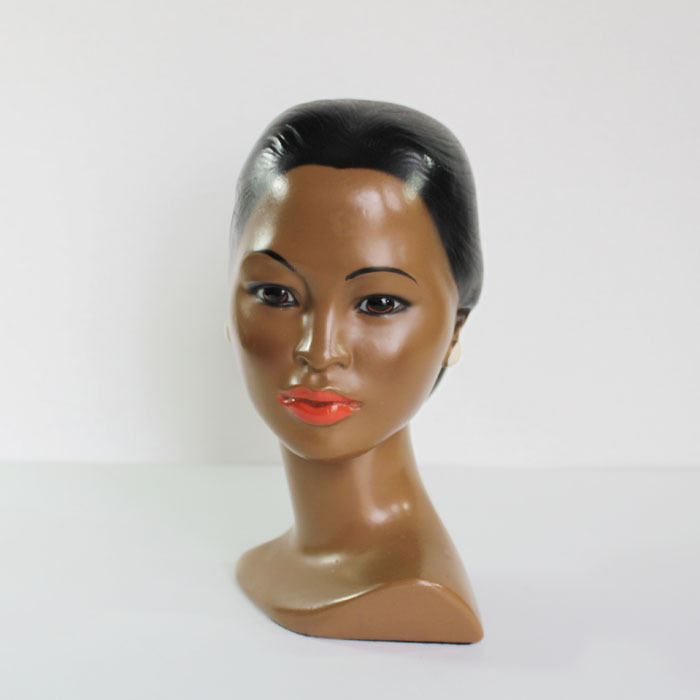 This beauty is a Marwal Chalkware Polynesian beauty. I listed is on Wednesday, and she sold on Thursday to a wonderful customer in Australia. She really is a beauty. I like train cases. 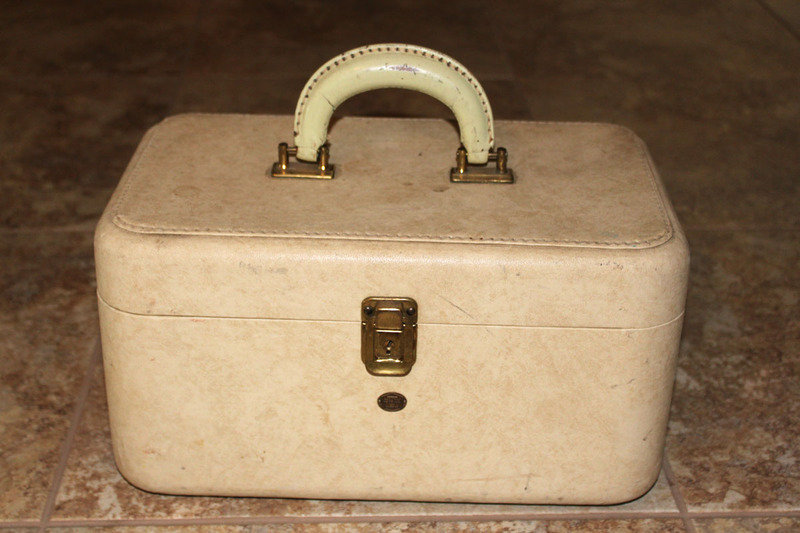 Or do you call them a makeup case, overnight case or even a travel case? Anyway I like them, and this one has character. 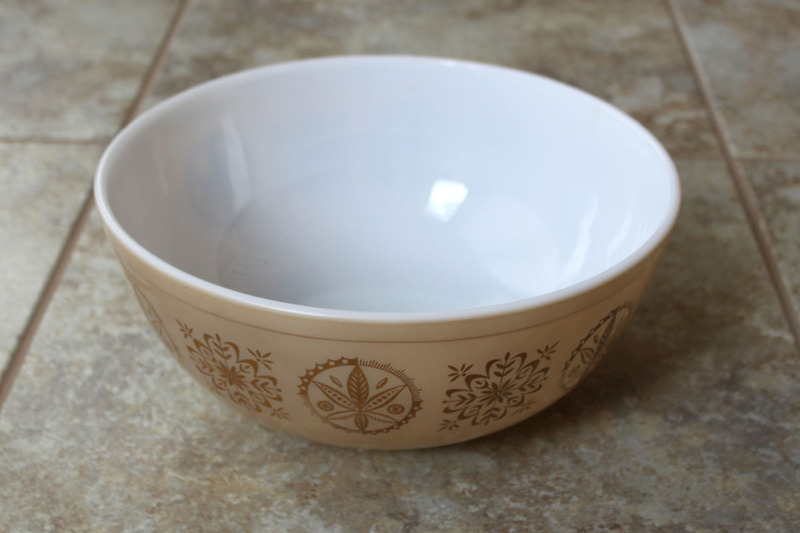 I really like the gold design of this Pyrex large mixing bowl. I still haven’t researched the name of the pattern yet. I normally don’t like gold, but this one is pretty. 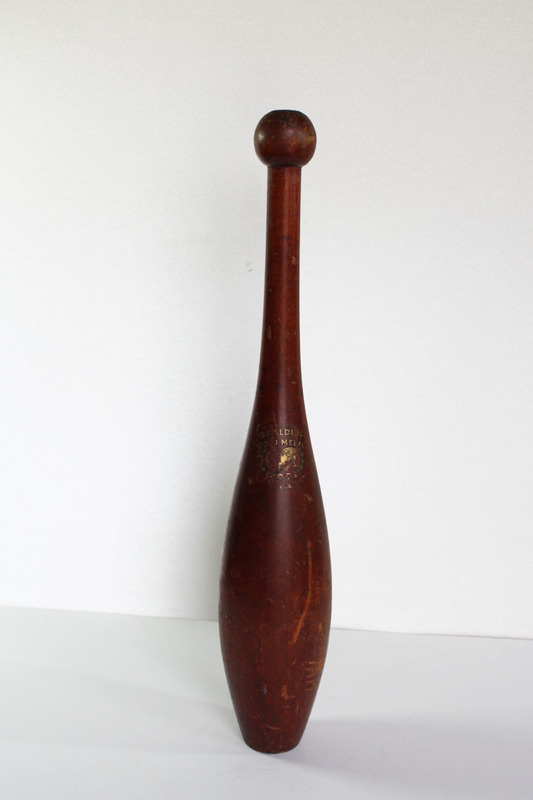 I was thrilled to find this Spaulding Indian Club in a box of wood I won at an auction. I think it would be a great piece for rustic decor. 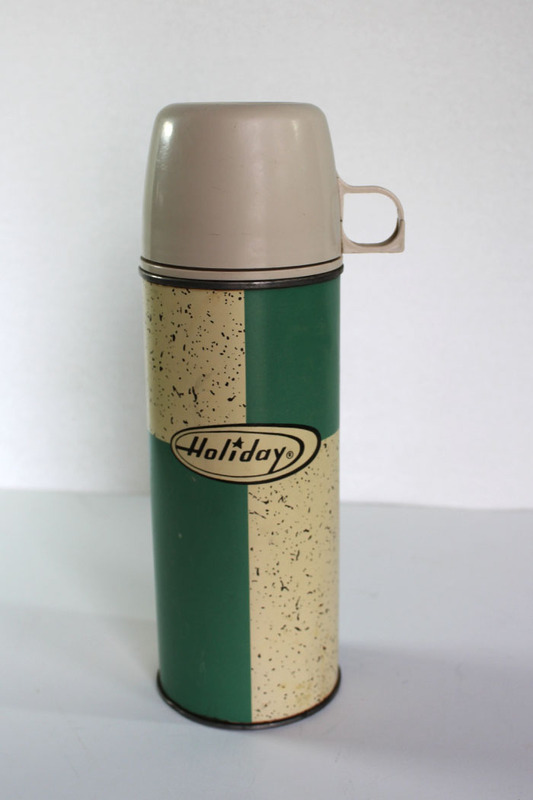 Isn’t this Holiday thermos fun? It isn’t as large as most thermos bottles, but what I like is that color. It also has “holiday” on it. I have it listed, but you can be sure it will be part of my Christmas decor if it doesn’t sell. 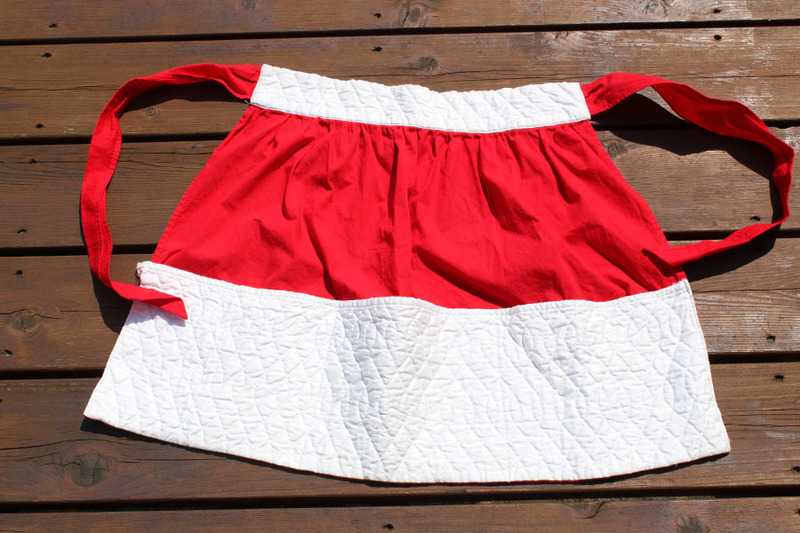 Since I mentioned the holidays, I had to show you this Mrs. Santa apron. I think it is adorable; any one playing Mrs. Claus would love it. It is quilted on the bottom. Some day I will try quilt again. I pieced one wall hanging together when I was pregnant with my youngest who is now 13. That was as far as I got. Just not enough time. Finally had to show you this large basket. 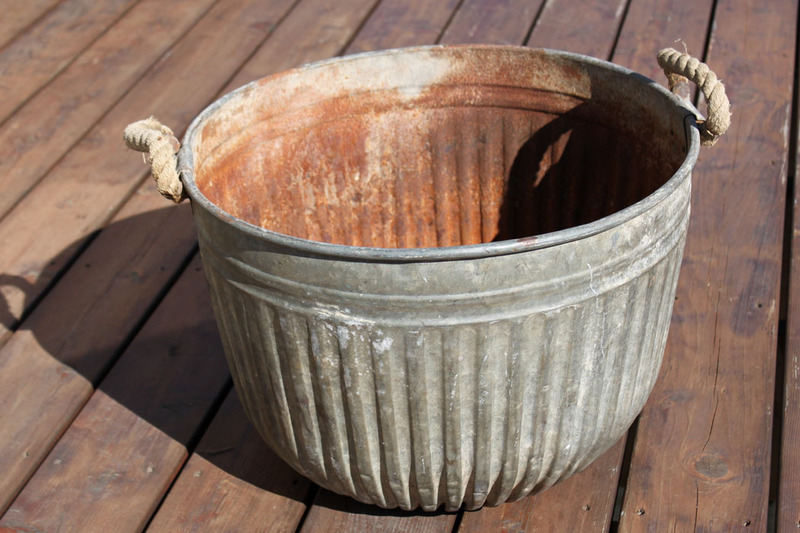 It is galvanized steel., and it is rusted. What I love is the rope handles. I can see it as a display piece tipped on its side. Maybe a blanket coming out of it and then fall flowers and pumpkins. If nothing else it will make a great flower-pot since it has pin holes in the bottom. With fall here, are you finding any good thrifted items? This entry was posted in Junkin' Pickin' Finds and tagged apron, basket, bust, Indian Club, Pyrex by Karen Grosz. Bookmark the permalink. wow! she is a beauty!! I love to see all the fin stuff you find! Thanks, Laura. I appreciate that you read my blog to see what I find. Yes, she was a beauty. I really hope she makes it to Australia in one piece. It would be sad to have her break.